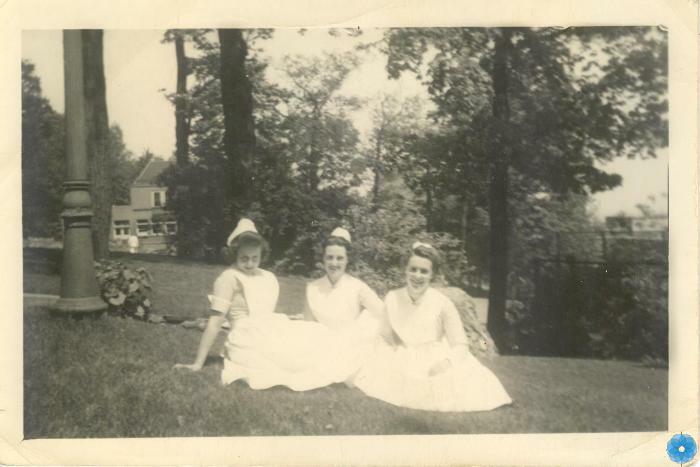 Description: Small black and white photograph of three women sitting on the grass, wearing nurse's uniforms, identified as Jean I. Gow on the left, Edith Shaw in centre, both of Bridgewater. The woman on the right is unidentified. There is a lamp post and trees, with a large building in the background identified as the Montreal General Hospital. History of Use: Taken to document women at nursing school.